While bits and pieces of the index of refraction n and extinction coefficient k for a given material can be found in several handbooks, the Handbook of Optical Constants of Solids gives for the first time a single set of n and k values over the broadest spectral range (ideally from x-ray to mm-wave region). The critiquers have chosen the numbers for you, based on their own broad experience in the study of optical properties. Whether you need one number at one wavelength or many numbers at many wavelengths, what is available in the literature is condensed down into a single set of numbers. 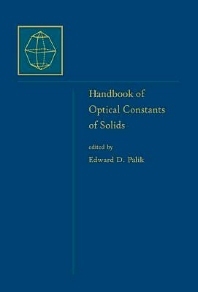 VOLUME ONE: Determination of Optical Constants: E.D. Palik, Introductory Remarks. R.F. Potter, Basic Parameters for Measuring Optical Properties. D.Y. Smith, Dispersion Theory, Sum Rules, and Their Application to the Analysis of Optical Data. W.R. Hunter, Measurement of Optical Constants in the Vacuum Ultraviolet Spectral Region. D.E. Aspnes, The Accurate Determination of Optical Properties by Ellipsometry. J. Shamir, Interferometric Methods for the Determination of Thin-Film Parameters. P.A. Temple, Thin-Film Absorplance Measurements Using Laser Colorimetry. G.J. Simonis, Complex Index of Refraction Measurements of Near-Millimeter Wavelengths. B. Jensen, The Quantum Extension of the Drude--Zener Theory in Polar Semiconductors. D.W. Lynch, Interband Absorption--Mechanisms and Interpretation. S.S. Mitra, Optical Properties of Nonmetallic Solids for Photon Energies below the Fundamental Band Gap. Critiques--Metals: D.W. Lynch and W.R. Hunter, Comments of the Optical Constants of Metals and an Introduction to the Data for Several Metals. D.Y. Smith, E. Shiles, and M. Inokuti, The Optical Properties of Metallic Aluminum. Critiques--Semiconductors: E.D. Palik, Cadium Telluride (CdTe). E.D. Palik, Gallium Arsenide (GaAs). A. Borghesi and G. Guizzetti, Gallium Phosphide (GaP). R.F. Potter, Germanium (Ge). E.D. Palik and R.T. Holm, Indium Arsenide (InAs). R.T. Holm, Indium Antimonide (InSb). O.J. Glembocki and H. Piller, Indium Phosphide (InP). G. Bauer and H. Krenn, Lead Selenide (PbSe). G. Guizzetti and A. Borghesi, Lead Sulfide (PbS). G. Bauer and H. Krenn, Lead Telluride (PbTe). D.F. Edwards, Silicon (Si). H. Piller, Silicon (Amorphous) (-Si). W.J. Choyke and E.D. Palik, Silicon Carbide (SiC). E.D. Palik and A. Addamiano, Zinc Sulfide (ZnS). Critiques--Insulators: D.J. Treacy, Arsenic Selenide (As2<$>Se3<$>). D.J. Treacy, Arsenic Sulfide (As2<$>S3<$>). D.F. Edwards and H.R. Philipp, Cubic Carbon (Diamond). E.D. Palik and W.R. Hunter, Litium Fluoride (LiF). E.D. Palik, Lithium Niobote (LiNbO3<$>). E.D. Palik, Potassium Chloride (KCl). H.R. Philipp, Silicon Dioxide (SiO2<$>), Type ( (Crystalline). H.R. Philipp, Silicon Dioxide (SiO2<$>) (Glass). H.R. Philipp, Silicon Monoxide (SiO) (Noncrystalline). H.R. Philipp, Silicon Nitride (Si3<$>N4<$>) (Noncrystalline). J.E. Eldridge and E.D. Palik, Sodium Chloride (NaCl). M.W. Ribarsky, Titanium Dioxide (TiO2<$>) (Rutile). Edward D. Palik received his B.S. in Physics 1950, his M.S. in 1952, and his Ph.D. in 1955 from Ohio State University. He specialized in far-infrared spectroscopy and was assistant professor at Ohio State University during 1955–1956. He was a NSF fellow at the University of Michigan in 1956 and 1957 and a General Motors Fellow at Ohio State University from 1957–1958. He became an NRC Fellow at the Naval Research Laboratory in 1958 and soon converted to a research physicist in 1959. During the rest of his career at NRL he worked in magnetooptics of semiconductors, for which he was awarded the Hulburt Award in 1964. This is the highest internal scientific award given at the Naval Research Laboratory. He also worked on the optical properties of semiconductors, total-internal-reflection spectroscopy studies of surface polaritons, cathodoluminescence studies of solids, and orientation-dependent etching of silicon in aqueous potassium-hydroxide solutions.He was editor for the first years of the newsletter of the Far Infrared and Submillimeter Wave Technical Group of the OSA. After his retirement in 1988, he joined the Institute for Physical Science and Technology at the University of Maryland as a part-time research associate. While there he carried out Brillouin-scattering studies of solids and studies of defects in Fabry Perot plates. University of Maryland, College Park, U.S.A.